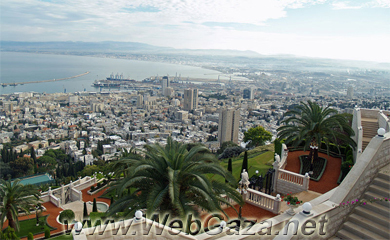 Haifa - Where is Haifa City Located? Haifa at the beginning of the nineteenth century was a small fishing village with a population of four thousand Palestinians. In 1869 German farmers from the Templar Society immigrated to Haifa and Jews began to immigrate in the 1880s. According to Enclyclopedia of the Palestinians, "Haifa's population grew during the Mandate from 24,634 in 1922 to some 128,000 in 1944, of whom 66,000 were Jews." In 1948 Haifa City was ethnically cleansed of all but 3,000 of its Palestinian citizens. In addition, fifty-one villages in Haifa District were ethnically cleansed and demolished by Israel's forces.